Available now from ECEFast , the new PR 9000 series of galvanic barriers from PR Electronics has IECEX approval and SIL 2 certification for most models. These galvanic barriers are programmable with a clip on display and push buttons to reduce the number of types required to cover all normal industrial applications. These PR 9000 series modules can be used as stand alone, DIN rail mounts, or they can be clipped onto the PR 9000 Power Rail system. 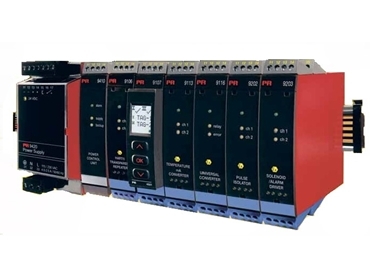 Power distribution to the rail, supply redundancy, and centralisation of a common module alarm system is managed with the PR-9410 Power Control Unit. The PR 9000 series of galvanic barriers offers high performance and reliability, with better than 0.1% accuracy, a five year warranty and SIL 2 certification on most models (SIL 2 Certification is by full assessment). These galvanic barriers are programmed using the PR 4501 clip on display/programmer. The menu systems used for module set up are simple to operate, are intelligent in structure, and there is a single path, so no parameters are missed in a programming session. individually allocatable modules which display a custom TAG number on the PR-4501. PR Electronics has been producing ATEX certified galvanic barriers for many years, meaning they have a large body of experience.